Progressive Field is a baseball park located in the downtown area of Cleveland, Ohio, United States. It is the home field of the Cleveland Indians of Major League Baseball and, together with Quicken Loans Arena, is part of the Gateway Sports and Entertainment Complex. It was ranked as Major League Baseball’s best ballpark in a 2008 Sports Illustrated fan opinion poll. The ballpark opened as Jacobs Field in 1994 to replace Cleveland Stadium, which the team had shared with the Cleveland Browns of the National Football League. Since 2008, the facility has been named for Progressive Corporation, based in the Cleveland suburb of Mayfield, which purchased naming rights for $58 million over 16 years. The previous name came from team owners Richard and David Jacobs, who had acquired naming rights when the facility opened. The ballpark is still often referred to as “The Jake”, based on its original name. When it opened, the listed seating capacity was 42,865 people and between 1995 and 2001 the team sold out 455 consecutive regular-season games. Modifications over the years resulted in several moderate changes to the capacity, peaking at 45,569 in 2010. After the 2014 and 2015 seasons, the facility was renovated in two phases, which upgraded and reconfigured several areas of the park and reduced seating capacity. As of 2017, seating capacity is listed at 35,051 people, though additional fans can be accommodated through standing room areas and temporary seating. Since moving to Progressive Field, the Indians have won nine Central Division titles and have hosted playoff games in ten seasons, the most recent being in 2017. Progressive Field is one of the few facilities in baseball history to host the Major League Baseball All-Star Game and games of the World Series in the same season, which occurred in 1997. The Indians have hosted games of the American League Championship Series in five seasons and have advanced to the World Series three times at the park. The Cleveland Indians previously played home games at Cleveland Stadium, which they shared with the Cleveland Browns of the National Football League. The Indians first played at the stadium, which seated nearly 80,000 people for baseball, for the 1932 and 1933 seasons, but returned to smaller League Park for most games in 1934. From 1936 to 1946, they played weekend and holiday games at Cleveland Stadium, and eventually night games and other dates where larger crowds were expected, moving to the stadium full-time in 1947. Cleveland Stadium was the largest stadium in the American League during its tenure as a baseball facility and was the largest stadium in Major League Baseball for all but a few seasons. Plans for a new stadium first began in 1984 when Cuyahoga County voters defeated a property tax for building a 100% publicly funded domed stadium, which would have been shared by the Indians and Browns. Later that year, committee leaders met to re-evaluate these plans, and a location was later agreed upon. The eventual site of the stadium, the location of the Central Market, was acquired in December 1985. In April 1986, designs for the new stadium were agreed upon and about a year later, demolition at the site started. Cuyahoga County voters approved a 15-year sin tax on alcohol and cigarette sales in May 1990 to finance the new Gateway Sports and Entertainment Complex, which included the ballpark, an adjacent arena for the Cleveland Cavaliers of the National Basketball Association (NBA), and two parking garages. Construction started in January 1992, and by May of that year, the concrete construction had been poured. In June 1992, Mel Harder, who pitched the opening game at Cleveland Stadium in 1932, and contemporary stars Charles Nagy and Sandy Alomar, Jr., executed the ceremonial first pitch at the site of the new ballpark before construction began. The installation of seating was completed in October 1993. The ballpark, which was referred to as “Cleveland Indians Baseball Park” and “Indians Park” on blueprints, cost approximately $175 million to build, of which $91 million was provided by Indians owner Richard Jacobs. The remaining $84 million was raised by the sin tax. During the eighth inning of Game 2 of the 2007 American League Division Series against the New York Yankees on October 5, a swarm of insects believed to be midges from Lake Erie, enveloped the playing field, severely distracting Yankees relief pitcher Joba Chamberlain, which caused him to walk outfielder Grady Sizemore, who later scored the tying run on a wild pitch. The incident became known as the “Bug Game”; however, this was not the first time the insects plagued Jacobs Field. 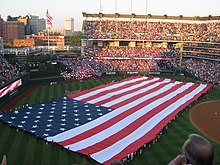 Progressive Field set a new MLB record between June 12, 1995 and April 4, 2001 in selling out 455 straight games. Demand for tickets was so great that all 81 home games were sold out before opening day in five separate seasons. The Indians retired the number 455 in honor of the sellout record. The Boston Red Sox later surpassed this record when Fenway Park recorded 456 straight sellouts on September 9, 2008. 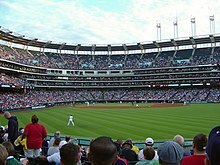 The record for the largest attendance at Progressive Field was set in Game 3 of the 1997 ALDS when 45,274 people attended the game. On Saturday, April 2, 2011, the Indians’ lowest attendance record was broken with a very small crowd of 9,853, and again the following day with an even smaller attendance figure of 8,726. Naming rights were acquired in 1994 by team owner Richard Jacobs, who paid for rights until the end of 2006. The Jacobs Field name gave rise to the nickname “The Jake” for the ballpark. The Indians announced on January 11, 2008, that naming rights to the park had been purchased by Progressive Corporation, a major insurance company headquartered in the nearby suburb of Mayfield, Ohio, for $58 million over 16 years. Removal of the iconic Jacobs Field sign on the front of the building began the morning of January 18, and the replacement sign was installed on March 25. Progressive agreed to pay $57.6 million for the naming rights for 16 years. There were discussions about instead naming the ballpark “Progressive Park”; however, it was later realized that this name belonged to a picnic facility in Council Bluffs, Iowa, so the name “Progressive Field” was decided upon instead. The ballpark was designed by HOK Sport, now known as Populous, a division of Hellmuth, Obata and Kassabaum. HOK designed it as the second retro-modern ballpark, with asymmetrical fences of varying heights, a smaller upper deck, and stepped tiers. It is similar to HOK’s Oriole Park at Camden Yards in Baltimore, which was the first retro-modern ballpark. The ballpark was sited to give a favorable view of Cleveland’s downtown skyline. The structural engineering was done by a Cleveland company, Osborn Engineering, which helped design League Park, Cleveland Municipal Stadium, “Old” Yankee Stadium and Fenway Park. It was designed to blend in with the city of Cleveland with its exposed steel design and the vertical light towers that match the smoke stacks of Cleveland’s industrial zone. The park features distinctive dimensions; left and right field are both 325 feet (99 m) from homeplate, but left field has a 19-foot (6 m) high wall, known as the “Little Green Monster”. The center and right field walls are 9 feet (3 m) high. The park features traditional hunter green seats angled at 8-12° on three tiers around the park except for center field which has no seats and left field which uses bleachers. The bullpens, reconfigured between the 2014 and 2015 seasons, are raised above the playing field, which allows fans to see pitchers warming up. Both bullpens are located adjacent to section 103 behind right-center field, with the Indians’ bullpen closer to the field. Like the majority of ballparks, the Indians’ dugout is along the third base line and the visitors’ dugout is located along the first base line. When the ballpark was built it contained 121 luxury boxes. A remodel and renovation between the 2014 and 2015 seasons removed six of them for a new total of 115, the second most in Major League Baseball. Prior to the start of the 1997 season, two sections with 480 seats were added onto the ends of the bleacher section. In 2004, South Dakota-based company Daktronics installed the then-largest video display at a sports venue in the world, measuring 36 feet (11 m) high by 149 feet (45 m) wide. The out-of-town scoreboard along the left field wall was also replaced.A new scoreboard system was installed for the 2016 season. The main scoreboard above the bleachers measures 59 feet (18 m) high by 221 feet (67 m) wide with 13,000 square feet (1,200 m2) of screen space, and is the largest scoreboard in Major League Baseball. In 2007, the Indians became the first American League team to install solar panels on their stadium. They also spent $1.1 million to convert a picnic area behind the center field fence into “Heritage Park”, which features 27 plaques honoring the Cleveland Indians Hall of Fame and 38 bricks, representing the team’s most memorable moments. There is also a memorial plaque commemorating Ray Chapman which was originally installed at League Park. This area is shielded by plantings so it does not interfere with the batter’s eye. The Indians installed a corkscrew-shaped wind turbine from Cleveland State University above the southeast corner of the ballpark in late March 2012, the first major league team to do so. The corkscrew–shaped wind turbine was successful in generating more electricity than individual turbines and was originally scheduled to be tested for two years, but had to be removed in late March 2013 because of cracks that had developed in the off-season. The team announced the first phase of renovation plans for Progressive Field in late 2014, which were completed prior to the start of the 2015 season. The area on either side of the right field gate, previously known as “Gate C”, was reconfigured, with a pedestrian bridge and concession buildings removed to open the views of the surrounding neighborhood. The statue of Jim Thome was moved to the area, while the statue of Bob Feller was moved to a new location in the area, while a new statue of Larry Doby was added. A two-story bar named “The Corner” was built, providing better views of the field as the Batter’s Eye Bar was often overcrowded on summer days. The bullpens, which had previously been separate, were relocated to the right center field area, allowing fans closer views of players warming up. To allow more light in the right field concourse, the mezzanine deck was reduced by several rows to open the area. The Kid’s Clubhouse was made two stories, and adults are now able to view the game from the clubhouse. Seating in the upper deck behind right field and down the first base line was removed and replaced with terraces, available for use by large groups. Additional changes included installation of new concession areas and options, many of which are from Cleveland-area eateries. The ballpark features several eateries from which spectators can watch the game. A glass-enclosed multilevel restaurant named the “Terrace Club” is located along the left field foul line on the suite level. Spectators need a valid game ticket and a pass to enter into the Terrace Club. On non-game days it is used for private and corporate events, such as business meetings, parties and weddings. The “Budweiser Patio” is a buffet eatery used mostly for corporate or private parties, located just behind the right field foul pole between the visitors’ bullpen and section 117. A new children’s play area named “Kids Clubhouse”, located on the mezzanine level, opened in May 2012. It includes arts and crafts areas, a climbing wall, a mini field where children can practice sliding and fielding, a batting cage, as well as large windows where adults can watch the game from the Kids Clubhouse. Progressive Field is occasionally used as a concert venue. It was first used for a concert on August 12, 1995 during its second season of use, when Jimmy Buffett played at the ballpark as part of his Domino College Tour. The panels set on the outfield grass to hold the stage, however, caused visible damage to the playing surface, leading Indians owner Richard Jacobs to ban concerts at the facility. Concerts returned to the ballpark in 2011 when the Indians hosted the Indians Music Festival, which featured Brad Paisley and Blake Shelton. Three years later, in 2014, Jason Aldean played at Progressive Field as part of his Burn It Down Tour, a performance that drew 40,516 fans and included Florida Georgia Line, Miranda Lambert, and Tyler Farr. In 2017, the ballpark hosted two concerts on consecutive nights, with Bill Joel performing on July 14 as part of Billy Joel in Concert, followed the next night by Luke Bryan and his Huntin’, Fishin’ and Lovin’ Every Day Tour.